Saved Actions are sales activities that are used repeatedly in your sales process. 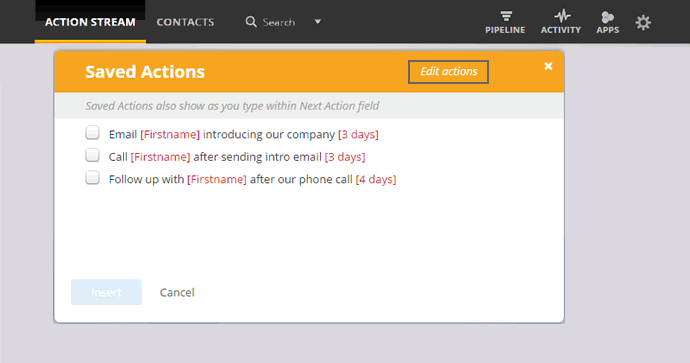 You can easily create a list of individual or group actions and assign to a contact in just one click. Click on the Saved Actions icon to the left of the Next Action box. In the Saved Actions pop-up, click on Edit action to add and edit actions. To add a new action, click on the New saved action field → click Save. By typing in the Next Action text field. Select from a list in the Saved Action pop-up and click Insert. Note: You can insert multiple saved actions at once. Once an action is inserted, edit if necessary → click Save. In the Saved Actions pop-up → click on Edit actions → select multiple actions from the list → click Group actions. Name your group e.g. Social Media Activities → click Save. 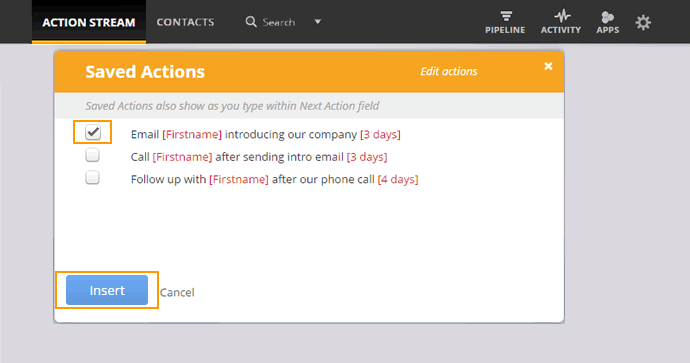 Use [Firstname] when creating an action and we'll auto-insert the contact's first name. Use [Days] to specify when the action should fall due. You can drag n' drop actions within the Saved Action pop-up. When importing a CSV.file, you can assign multiple actions only if they are saved as a group in Saved Actions. When updating actions in bulk, you can access your Saved Actions and grouped actions. All users on the account can create Saved Actions. Once created, all users have access to assign them to contacts. For example: If a sub user / Administrator creates a set of Saved Actions, another sub user can use them. How to update actions for multiple contacts?